Wellow. 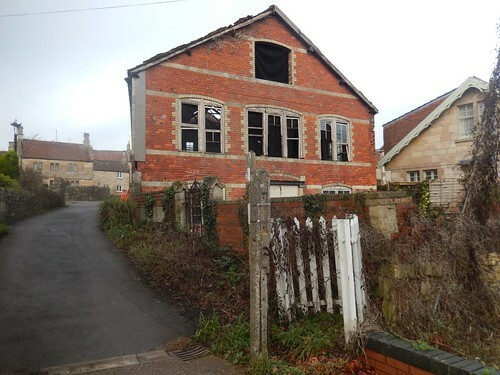 A North East Somerset village that I seem to be visiting quite frequently. Before writing this post, I’ve already returned once this year and have plans to revisit the area on a group walk next month. Post-My Black Mountains Triumph, this was a point where I saw an opportunity to cram in the miles and possibly get very close to the one-thousand miles mark. But primarily, this was going to be a pre-walk in order to investigate a few different footpaths and hopefully confirm a complete circuit for February. 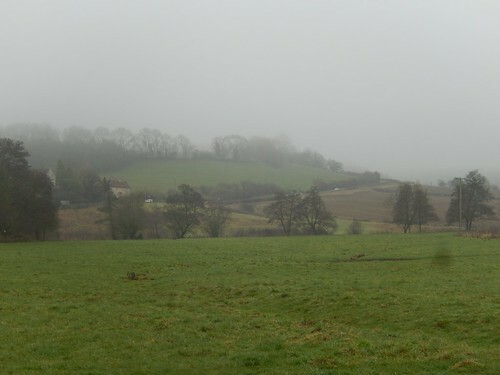 From the free village car park in Wellow, I climbed Station Road to turn east. This time, I left the roadside for the local church and would continue from there. 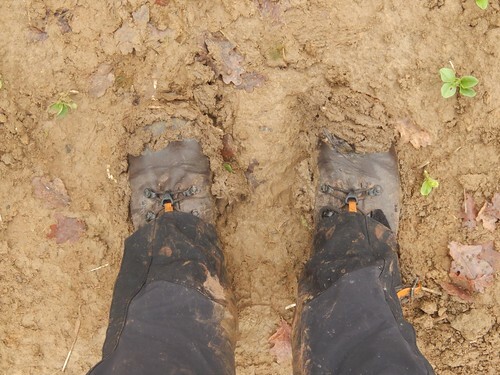 From the very next field, I was staring plain at the mud beneath (and soon to encase) my boots. 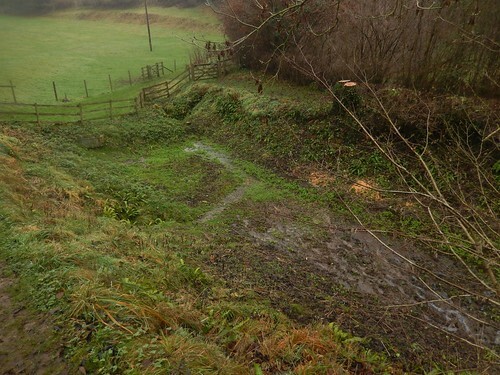 Somewhere around here lies the site of St. Julian’s Well. I was hoping for a sign or information board that would make it clear. 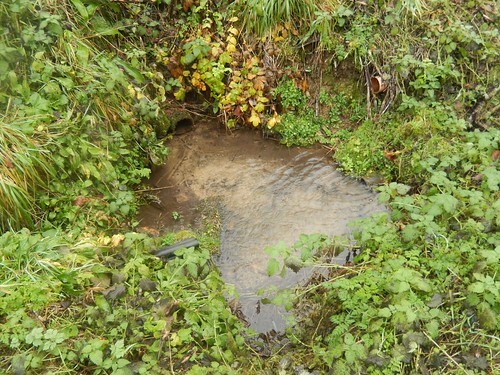 Maybe ever a small building or structure to enclose the well… Even today, I remain uncertain of where and whether it still exists. Onwards and the gradient soon increased towards the road corner and Twinhoe Green. 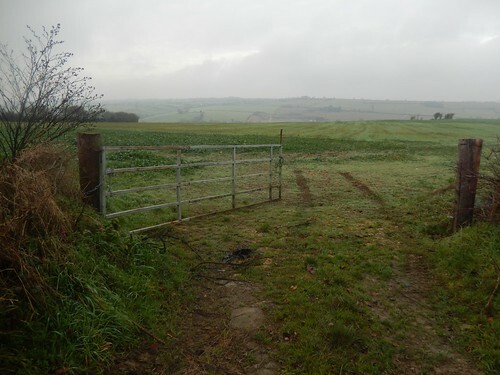 There was an explanatory note attached to one of the kissing gates, stating that while the landowner was willing to permit the current right of way across his land (which was very clear to follow), he was not prepared to allow the development of any further rights of way. Along with the usual reminder for walkers to stick to the path. 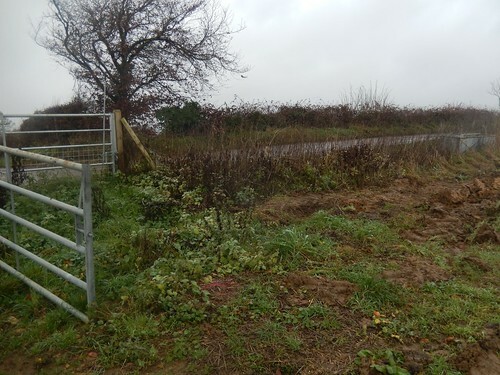 I thought this was quite a fair approach, where another landowner might (might) illegally prevent access to all paths with barbed wire and discarded pallets, for example. Joining the road momentarily from one gate to turn right and pass through another, I could turn back and see the village with its surrounding landscape vanish within the fog and low cloud. 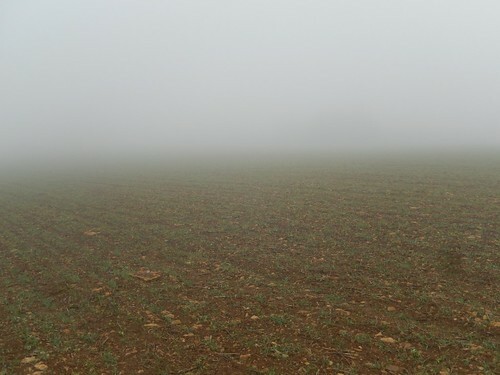 Visibility, on the approach to Middle Twinhoe Farm, was almost on a par with what I’d seen in Wales a day earlier. At least this land was quiet and cow-free. It’s not at all clear in my photo above but I could just make out a small tump of trees and used that to navigate towards the path running along its northern edge. 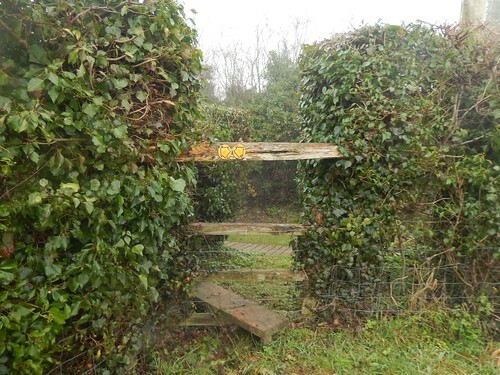 Arriving at the end of a field and with a driveway beyond, I encountered this stile. Again, it’s not perfectly clear from the photographer’s perspective but there’s a horizontal length of wood just ahead of the stile that turns it in to a minor obstacle course… Anyone crossing over without a backpack on should be okay. I really don’t see its purpose and it’s an issue that has been reported. 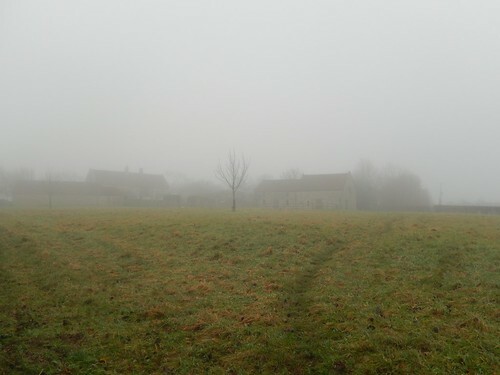 Turning east and away from the road once more, I caught the ghostly image of the farm house and buildings. Ahead of this, the downhill path was gratifyingly carved in to the landscape. 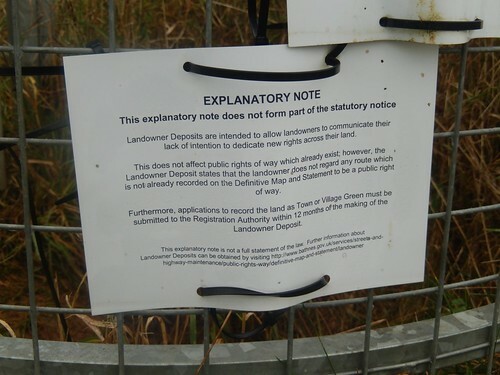 Landowners, please, take note! 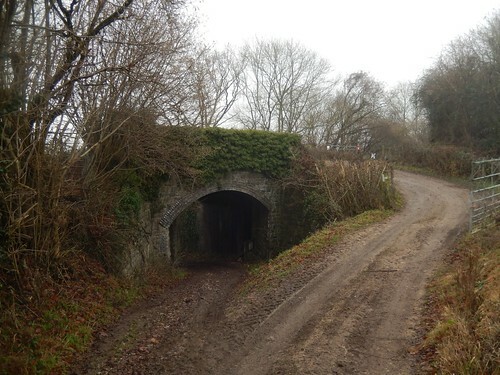 Continuing on a welcome descent, I arrived at a junction with the cyclepath that follows the local line of a former railway. I believe it used to run all the way to Bournmouth – at least, I know ‘a’ line following that journey used to pass through here. Looking at my map, I’d assumed I’d be able to climb up and on to the cycle track from here… But the gate (which happened to have been left open on this occasion) was wrapped in barbed wire and warned of ‘No Public Writing Way’ in a large and undeniable font [I thought I had photos of this but, apparently, they’re gone]. I decided not to ‘trespass’, even though I could physically pass through. There was every chance it would be locked when I returned with a group. 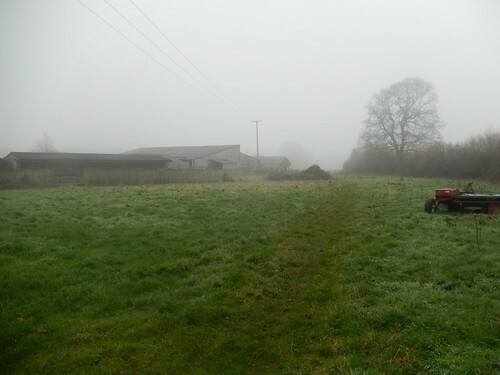 So, instead, I returned to the farm, continuing on to the road (past a small gathering of yapping Jack Russells) that I had been loosely following. 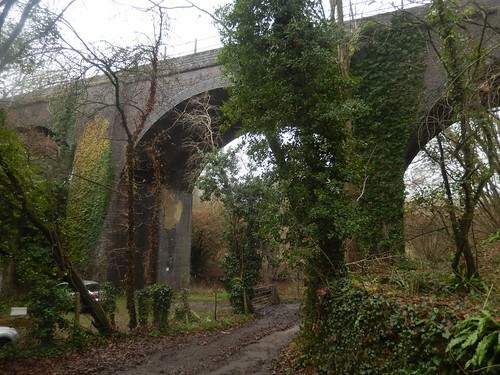 Maybe a mile further on, I turned right beneath the viaduct to follow another public right of way. I can’t remember now, whether this was a private area reserved for fisherman with permits or, whether fishing was prohibited altogether. I followed the right of way across the fields and on to the B3110 road near Midford Hill. To my left, I could see the same road winding up towards Brassknocker Hill. 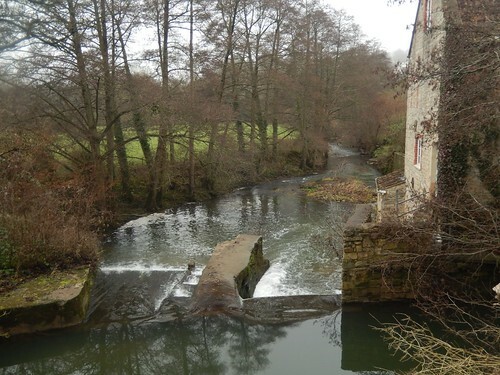 Across a footbridge and I arrived at the road with a weir down to my left. 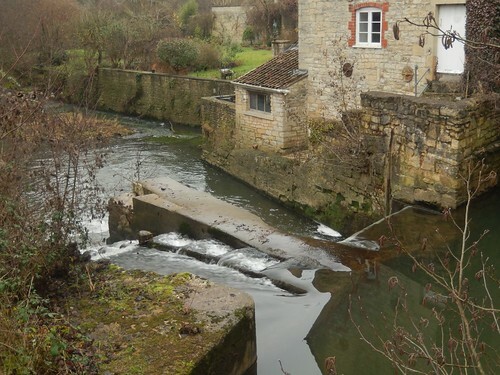 I’d guess the building used to house a mill and waterwheel. 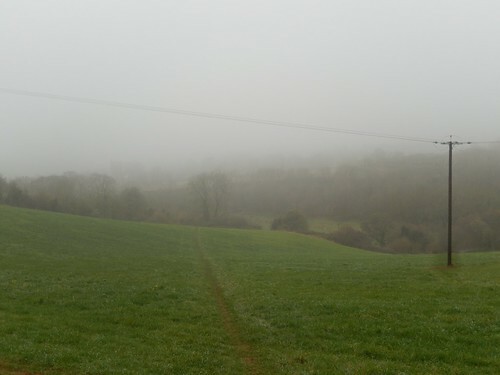 Over the road and my route began to climb, steeply and now following a byway destined for Pipehouse near Freshford. 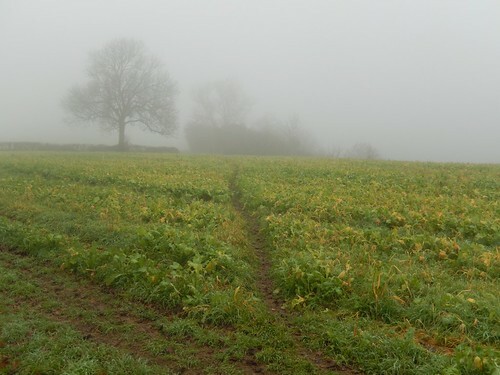 A small team of runners passed in the opposite direction before I eventually reached the village and turned right (south) down a narrow path, heading towards Hinton Charterhouse. 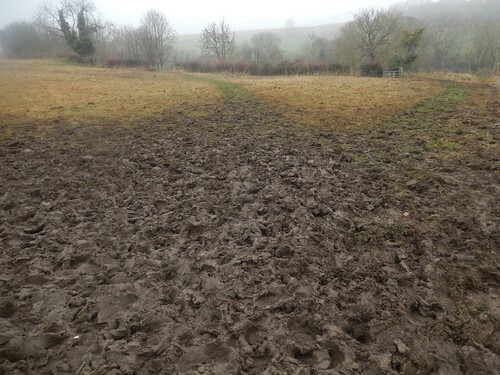 In one of the following fields, a family-sized group of walkers crossed my path, with each member rightfully wearing a pair of wellies… Here, the mud was both thick and sticky; adding weight to my boots by the kilogram. 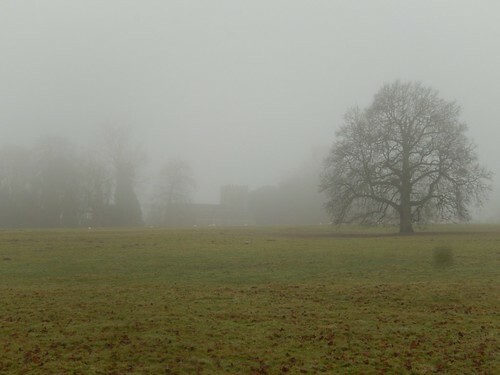 On the Ordnance Survey map, you can see that the remains of Hinton Abbey and its Carthusian Priory are said to exist nearby… Not that I could see them and I don’t believe the mist or low cloud was to blame. 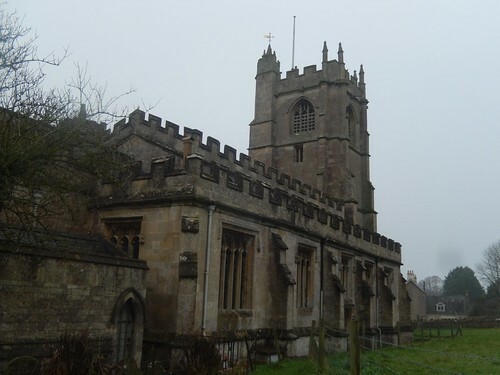 I passed the same church that I had first found a couple of years ago at Hinton Charterhouse, before turning west along a familiar route; down through Cleaves Wood to cross over a ford at the bottom of Norton Lane. A previous attempt to follow a more southerly route in the same direction had seen me fight through fields of shoulder-height grass. 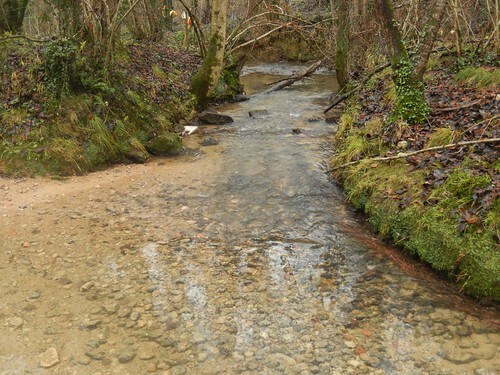 At least here, I could wash away the bulk of the mud from my footwear. 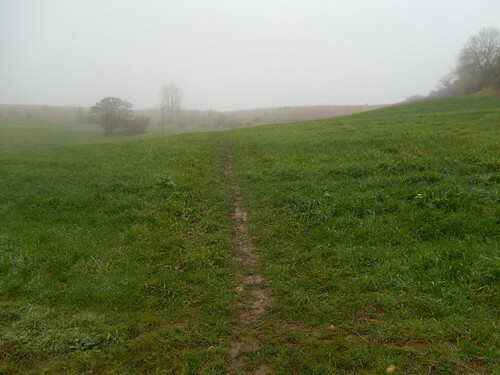 This byway began to climb again and I followed it past Upper Baggridge Farm to reach another road, with Wellow almost in sight. On another walk last year, I’d attempted to find the trig point within reasonable heights of grass. According to my map, it should be around here, beside the gate. 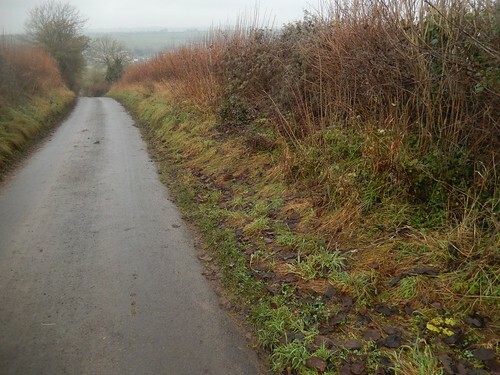 But, even with the vegetation cut back, I could not see it on either side or through the hedge line from the road. It’s possible I’ll stop for lunch in this same field when I come to lead my walk. Being next to a road (even a quiet one) is far from idyllic but, looking east, you can see the Westbury White Horse (on a clear day) and there is a public right of way running across it. 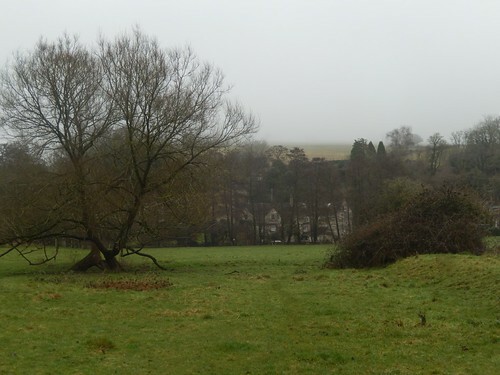 From here, I would normally continue west, along the road and through further woodland, towards Stoney Littleton Long Barrow… Having seen the ancient monument twice already in the previous twelve-months or so, I decided to give it a miss. 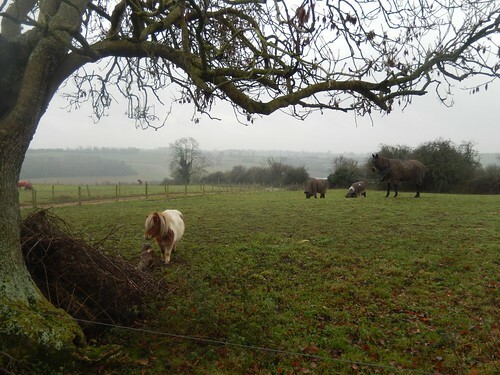 Instead, I descended north along the road of Hassage Hill. 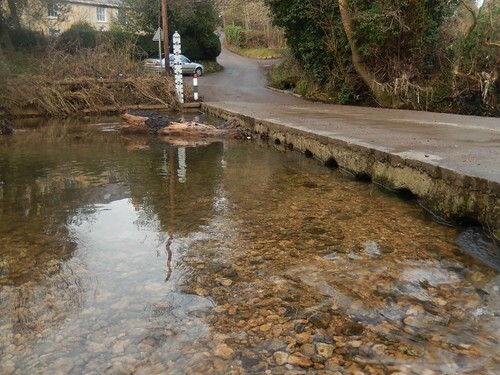 Either side of the tarmac, you could see where recent flood water had (possibly) run its way down towards the ford at the bottom. 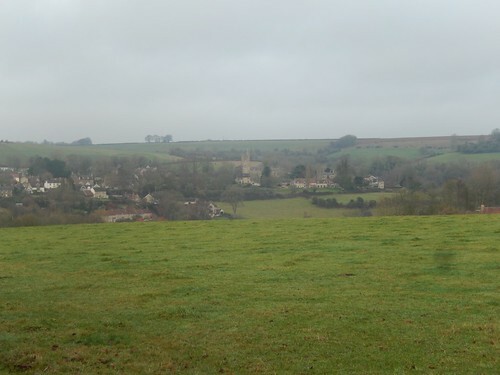 Further on this descent and I had a fairly clear view of the entire village of Wellow. 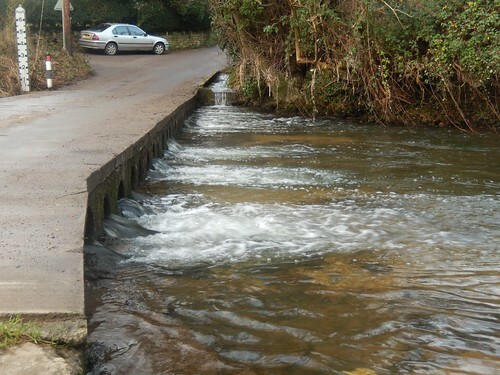 At the bottom of the hill, I’d expected to find the ford flowing at a much higher level, following the floods of only a few weeks prior to this walk. Still, the water was plentiful enough for more to clean my boots one final time. From here, you can either climb the road of Mill Hill or take a narrow path branching off from the footbridge to join railway lane, with this neglected building and the local pub just beyond… I would recommend the road for any winter walks, as the sheltered path was surprisingly muddy and not most ideal when you’re returning to your car. 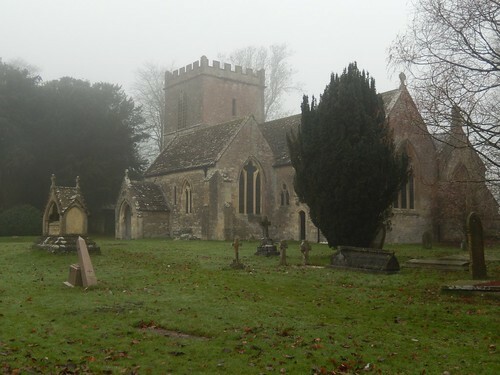 Soon, you’ll get to read of my recent return to Wellow, less than two weeks ago.